What if my pet injests some crystal litter? If your pet eats a couple of crystals or small bites of litter, he should be perfectly fine. Just provide your pet with water. The crystals will pass through his system. However, you should make sure your pet doesn't eat a large amount of litter. Contact your vet if you notice any changes in your pet's behavior or health or if you suspect your pet has eaten more than a few bites of any type of litter at one time. If your dog often tries to eat your cat's litter, you can take extra steps to keep your dog out of the litter box. Use a hood with the litter box. Set the timer to sweep 5 minutes after your cat uses the box (for ScoopFree Ultra boxes). 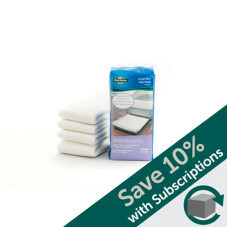 Put the litter box somewhere your dog can’t get to it, such as in a closet or on a raised shelf. Put the litter box in a room your dog can’t get in by closing the door and adding a cat door. Use a pet proofing spray or barrier to keep your dog away from the litter box area. 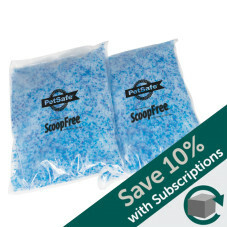 What are ScoopFree litter crystals made of? The blue crystal litter is made of a silica gel. The crystals are non-toxic and perfectly safe for people and animals if eaten accidentally. Silica gel is an inert substance that’s mined from the earth. A derivative of silica gel is used in many powered drinks and soups as an anti-clumping agent. 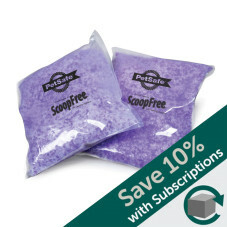 Has the litter formula or quality changed since ScoopFree moved to PetSafe? 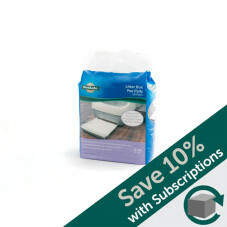 The packaging may have changed, but the litter trays have exactly the same litter crystals your cat knows and loves. 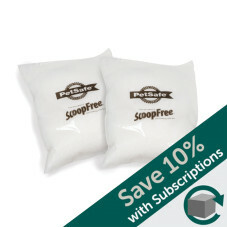 We're always working to improve our products based on your feedback, so we may upgrade the litter formula in the future. Learn more about our continuous product development process. How often do I need to empty the waste receptacle? Depending on the level of use, we recommend you empty the waste receptacle every other day to control odor build-up and bacterial growth.